Super-pure hydrogen peroxide | Products | Mitsubishi Gas Chemical Company, Inc. 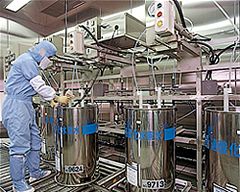 Since 1933, when we succeeded in the first commercial production of Hydrogen peroxide in Japan, our firm has maintained its status one of the prominent Hydrogen peroxide manufacturers in the world. From the infancy of the semiconductor industry, we engaged in the development of Hydrogen peroxide meeting the electrical chemical specifications required. Years of intensive researche aimed at the improvement of quality have resulted in the commercialization of Super-pure hydrogen peroxide, applicable to the fabrication of devices with a high integration density. 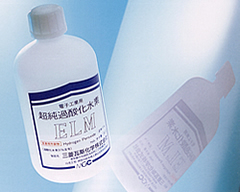 This product is widely used, not only as a cleaning agent, etchant, and polishing agent for the wafer-preparation process, but also as a cleaning agent, photoresistance inhibitor, and etchant, for device-fabrication processes.